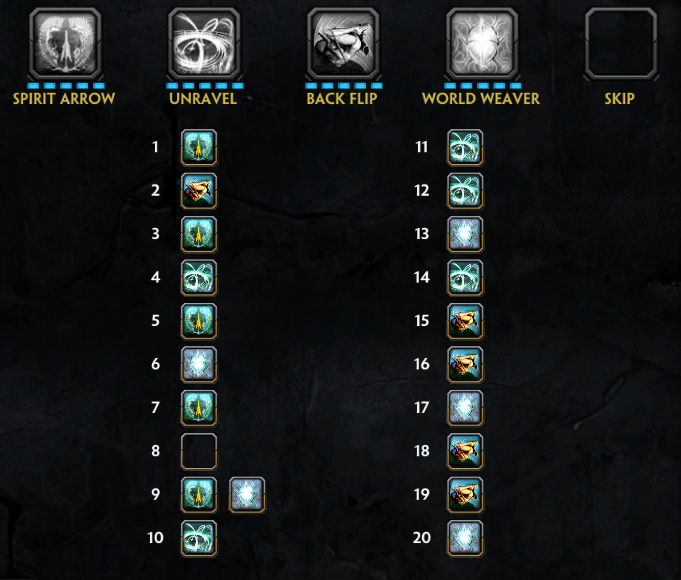 0.4: Why did nobody point out my build had 7 items? Rewrote the potential 6th item section to counteract this. 0.3: Added extra effects of Broken Weaves to Skills section, and some friends to the matchup section other than just foes. 0.1: Added introduction, items and skills chapters. Welcome to my guide for Neith, The Weaver of Faith. I have put a lot of time and effort into this guide, trying to give you, the reader and player of this amazing game and god, a better understanding about Neith and how to build her. Neith is a strong ability based Hunter, meaning that while she does really good with auto attacks she has no steroid so to speak of. This makes her midgame stronger because her abilities scale hard, but her lategame is slightly weaker than eg. Rama, who has a steroid on his Pick Me Up. You start with Bluestone Pendant, Spiked Gauntlet and a Healing Potion. Try to stay in lane for 1450 gold, so you can get Devourer's Gauntlet and another Healing Potion (it's only 50g, and it's really worth it, because you still have to start building stacks so your lifesteal isn't that awesome yet). Keep farming, there is no real point in roaming for team fights, call misses (VF1 / VF3 depending on your side) and fire your ult if you can help secure a kill (or snipe a runner) but just focus on farming and stacking. After finishing Devourer's Gauntlet you get 1550 gold Warrior Tabi. As mentioned earlier, Neith is an ability based hunter, so making her abilities hit for more is more important than the attack speed from Ninja Tabi. Then depending on farm, kills, assists and tower gold, get 1700 gold for Ichaival or 2200 gold for The Executioner. This is mostly dependant on how hard you get ganked etc. You get the one you didn't get after the first anyway, together with Greater Sprint. Now that you have your core items online, you can join teamfights, but don't stick around towers for 5 minutes, go back to a sidelane and keep farming. You want your items as fast as possible, preferably before the other Hunter. You can kite pretty well with Greater Sprint and Backflip, and really practise on hitting as many Spirit Arrows as you can, not only for the damage but also for the snare. With half decent teamfights you should get your Rage pretty fast, and with the crit from your Rage. Brawler's Beat Stick When you are facing Aphrodite support, or have a Hel or Ra getting out of hand. Generally it's easier if an AoE (Area of Effect) mage buys a Divine Ruin but a Brawler's Beat Stick is never a bad pickup against these gods. Magi's Blessing Go this if you are getting chain CC'd or if they have really good initiation tools (like a Sobeks Charge Prey) This combined with Greater Purification or Greater Aegis should give you some much needed defense against CC heavy teams. The Crusher aka The Tower Melter. This is the ultimate split pushing item. If you don't teamfight that much getting The Crusher will increase your split push potential A LOT. Also, the extra penetration is really good with your skills. Deathbringer is really good if you teamfight a lot. Rage increases your crit proc potential, and Deathbringer increases that crit damage. Your go-to item for teamfight heavy games. Keep in mind though, this is NOT your default choice! While this sounds tempting, DO NOT go for this by default, everything in Smite is about reacting to the game. This is when you start to fall off compared to other hunters (don't worry, Neith is still VERY strong! ), but your mobility and snare will keep you a force to be reckoned with. And if it gets really out of hand, an Elixir of Power will help you dump your excessive gold. If the enemy carry gets out of hand, getting a Shield of the Underworld will prevent him/her from lifestealing from you AND returning 40% of the damage, so it will help you outbox him/her. WHEN to get your second active is also up to the game really. I tend to get them after my Rage, but I've seen a lot of people get them either a lot sooner, a lot later, or not at all and still carrying. Puts a weave on the ground where someone died (friend or foe), or after a backflip. Enhances your main skills. Mostly used with Spirit Arrow to make an aoe explosion/root. Also important to know, this ability GOES THROUGH WALLS! If you hit a Spirit Arrow over a Broken Weave it will detonate, dealing damage and rooting everyone in the area. This is great for teamfights, early wave clearing or sometimes if you can time it right, to stop ganks in your lane. Mostly used as a selfheal. Goes over walls, and can be used to pick someone off if you missed your last auto attack since it has slightly more range. If you hit an Unravel over a Broken Weave it will heal you for an extra amount. Not as useful as the Spirit Arrow explosion in general, but good to keep in mind just in case. Mostly used to escape, or to put a Broken Weave down before a teamfight (be sure to have sprint/beads or backflip (up again) if you do it before a teamfight). Global arrow. The longer she charges the more damage it does. The art is to balance damage, and firing before it's fully charged to make sure an enemy doesn't get away. NOTE: I skill Spirit Arrow at level 5, then World Weaver at level 6, so I have better clear (and there's no real need for World Weaver at level 5 anyway). After that, skip a point at level 8, then skill both Spirit Arrow and World Weaver at level 9. This is a personal preference build, many prefer to skill their ult on 5 anyway, but since this should be around 3 minutes when your support is doing mid camps anyway going from 5 to 6 should not take long at all. This section was the most suggested section to be added. I am not great with this kind of thing, but I will try my best. Since it is a duo lane, the amount of potential matchups increases significantly because of the amount of hunter/guardian combinations, I won't cover every single god. Geb's Stone Shield makes it harder to poke, and it removes the snare from your Spirit Arrow. Also, when you try to snipe someone (mostly the enemy Hunter in this case) with World Weaver, be sure that Geb's Stone Shield is either on cooldown, or that Geb isn't around to protect that person. Xbalanque is the only hunter right now that can straight up outpush Neith. He is absolutely ridiculous with his Branching Bola. Play very careful against him, don't try to box him because he WILL win, but try to get the minions before they get hit by the tower too. Remember, you can take a few shots, you can heal up with Unravel, but don't go overboard. Ullr can clear the wave in 1 shot just like Neith with his Bladed Arrow. The thing is, a good Ullr won't just shoot a Bladed Arrow and back off, he will then use Wield Axes and try to hit you with Thrown Axe, causing you to get hit by all minions and giving him a few free shots in. Same advice as above, be careful, but remember you can heal up with Unravel. Boxing with Ullr is possible after if you managed to juke his Thrown Axe. Ymir, Cabrakan, Sylvanus are really really great too, because they can stun the enemy, making it almost impossible to miss your Spirit Arrow for the chain stun (root on yours, but you get my point). it's a nice guide. most of the items are okay but I won't recommend Qin's Sais as it got nerfed into the ground (also the passive of ichiavali and The Executioner work very well together). Also would I recommend getting ichiavali before The Executioner and getting The Executioner after the Rage Deathbringer combo. this is because the pen form ichiavali is enough and it will boost your attack speed more. Also do you want to get Rage and Deathbringer so you will be more useful because the last item is something that sometimes won't even be finished. further this guide is pretty good (can up the bbcoding a bit and at more chapters like pros & cons and teamplay). 88380 Devampi it's a nice guide. most of the items are okay but I won't recommend [[qin's sais]] as it got nerfed into the ground (also the passive of [[ichiavali]] and [[the executioner]] work very well together). Also would I recommend getting [[ichiavali]] before [[the executioner]] and getting [[the executioner]] after the [[rage]] [[deathbringer]] combo. this is because the pen form [[ichiavali]] is enough and it will boost your attack speed more. Also do you want to get [[rage]] and [[deathbringer]] so you will be more useful because the last item is something that sometimes won't even be finished. further this guide is pretty good (can up the bbcoding a bit and at more chapters like pros & cons and teamplay).